If you are asked to write a message to a stranger, what kind of message would you write? 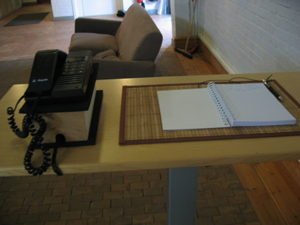 With a hacked telephone and visitors handwritten messages adressed others to them unknown persons an exchange and a kind of communication was created. When a person is located in the detection area the telephone will ring. If the person choose to lift the receiver s/he will hear a voice asking for help with writing a message adressing the next person lifting the receiver. 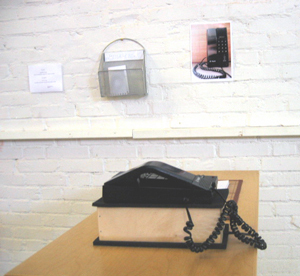 When the message is written s/he is allowed to read and keep another message kept in the box hanging on the wall, but only after exchanging it with the newly written one.